I am the Director, Official Representative and Coordinator of Original Play for Europe. By education I am a teacher. I completed my studies at the Teacher Training College in Czestochowa and my Postgraduate Studies in Policy and Education Management at Warsaw University. I am a mother of two great kids. I have been working with the Original Play program and cooperating with Fred Donaldson since 2002. I organize and lead workshops, training seminars and practical trainings in Poland and other countries. 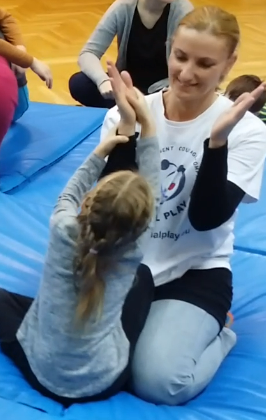 I have realized the Original Play program in institutions such as primary schools, gymnasiums, high schools, all kinds of kindergartens, institutions for special needs children and adults, integration institutions, special purpose schools and education centers, hospitals for cancer children, and children under respirators, educational and care institutions, orphanages, and pre-adoption centers. I also cooperate with some Polish universities. 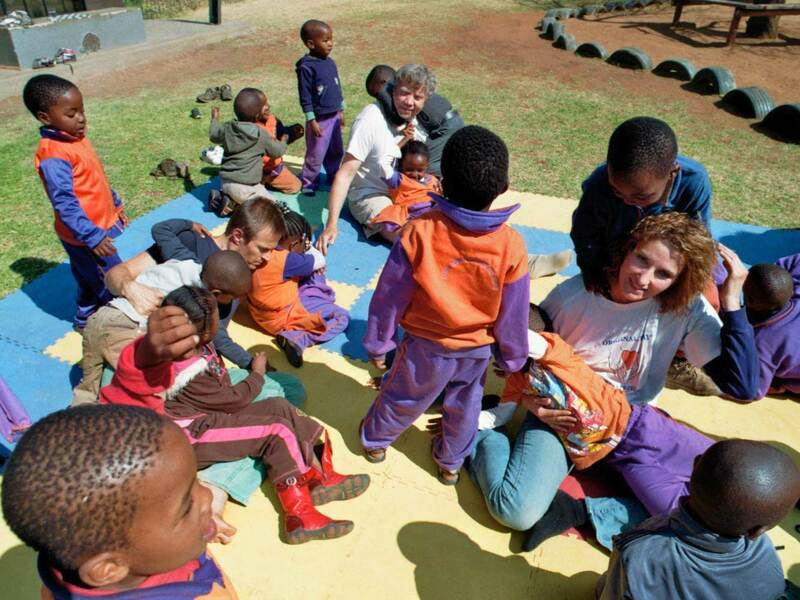 I have played with more than 10.000 children all over the world. In 2008 I received a recommendation for The Original Play program from the National in-service Teacher Training Centre in Poland. Its principles were accepted for the values it promotes, simplicity and at the same time variety. I was invited by The Permanent Representative of the Republic of Poland to the United Nations Office in Geneva together with the International Korczak Association to the international seminar devoted to Dr. Janusz Korczak:” Towards Inclusive Education- Janusz Korczak and the Convention on the Rights of the Child”. The seminar was held in May 2014 in the premises of the Polish Consulate. I received honorary patronage for The International Project of School Exchange in Original Play program from The Polish Committee of UNESCO. Since 2004 I have led the Original Play Promotion Center, which coordinates and promotes Original Play in Poland and other countries. I organize International Training Seminars in Original Play. Specialists from all over the world come to these seminars from the USA, Austria, Sweden, Germany, Italy, Greece, the Czech Republic, Switzerland, Holland, Bahrain, and France. 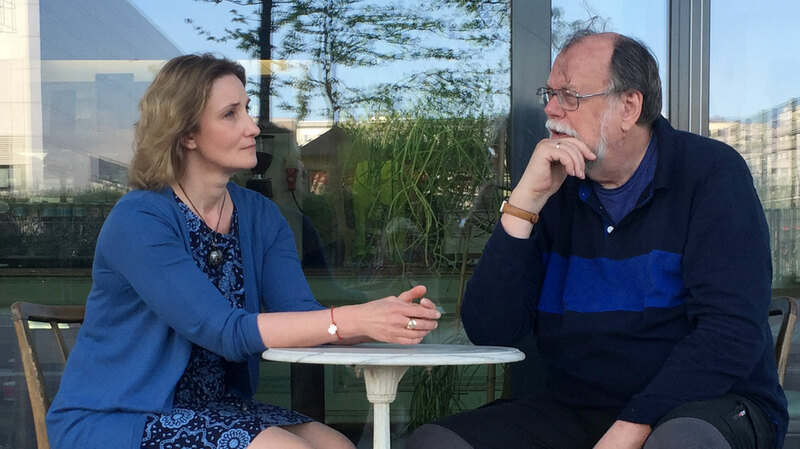 I am the Founder and the Member of Supervisory and Management Board of International Foundation for Original Play and a Member of The Advisory Council for the Austrian Original Play Association. Jestem oficjalnym przedstawicielem i koordynatorem programu Original Play® w Europie. Z wykształcenia jestem nauczycielem. Ukończyłam Wyższą Szkołę Pedagogiczną w Częstochowie i Podyplomowe Studium Polityki i Zarządzania Oświatą na Uniwersytecie Warszawskim. Zajmuję się programem Original Play i współpracuję z Fredem Donaldsonem od 2002 r.
Organizuję i prowadzę kursy, warsztaty, seminaria i różnego rodzaju treningi praktyczne w Original Play, w Polsce i w innych krajach. Jestem mamą dwójki wspaniałych dzieci. Zastosowałam Original Play w Polsce, w placówkach tj. : szkołach podstawowych, gimnazjach, przedszkolach, placówkach dla dzieci ze specjalnymi potrzebami, placówkach integracyjnych, ośrodkach szkolno- wychowawczych, szpitalach dla dzieci chorych na nowotwory i dzieci pod respiratorami, w placówkach zajmujących się edukacją i opieką nad dziećmi (ogniska szkolno – wychowawcze, świetlice socjoterapeutyczne, ośrodki praedopcyjne, domy dziecka). Bawiłam się z ponad 10 tys. dzieci w różnych częściach świata. W 2008 r. otrzymałam dla Original Play rekomendację Centralnego Ośrodka Doskonalenia Nauczycieli, w Warszawie. W 2014 zaprezentowałam Original Play w Polskim Przedstawicielstwie przy Biurze Narodów Zjednoczonych w Genewie w ramach seminarium: „ Towards Inclusive Education- Janusz Korczak and the Convention on the Rights of the Children”. Otrzymałam dla projektu „Edukacja dla pokoju- Międzynarodowy Projekt Szkolnej Wymiany dzieci w ramach programu Original Play” honorowy patronat Polskiego Komitetu ds. UNESCO. Prowadzę Centrum Promocji ORIGINAL PLAY, które od 2004 r. koordynuje i prowadzi działalność promującą Original Play w Polsce i za granicą. Organizuję międzynarodowe seminaria w Original Play, na które od 2008 r. przejeżdżają specjaliści z całego świata: USA, Austrii, Niemiec, Szwecji, Szwajcarii, Francji, Włoch, Norwegii, Grecji, Bahrajn. Współpracuję z kilkoma uczelniami wyższymi w Polsce. Jestem Fundatorem, członkiem Rady Nadzorczej i Prezesem Zarządu Międzynarodowej Fundacji Original Play, a także członkiem Rady Nadzorczej Austriackiego Stowarzyszemia Original Play. Ich bin Direktorin, offizielle Vertreterin und Koordinatorin von Original Play in Europa. Mein Grundberuf ist Lehrerin. Mein Studium habe ich am College für Pädagogik in Czestochowa und mein postgraduales Studium in Politik- und Bildungsmanagement an der Universität Warschau absolviert. Ich bin Mutter von zwei tollen Kindern. Seit 2002 arbeite ich mit dem Original Play Programm und kooperiere mit Fred Donaldson. Ich organisiere und leite Workshops, Trainingsseminare und praktische Trainings in Polen und anderen Ländern. Ich habe das Original Play Programm in Institutionen wie Volksschulen, Gymnasien, Kindergärten aller Art, Einrichtungen für Kinder und Erwachsene mit besonderen Bedürfnissen, Integrationseinrichtungen, Sonderschulen, Bildungszentren, Krankenhäusern für Kinder mit Krebserkrankungen und unter Beatmungsgeräten, in Bildungs- und Betreuungseinrichtungen, Waisenhäusern und Adoptions-Zentren durchgeführt. Ich kooperiere auch mit einigen polnischen Universitäten. Ich habe mit mehr als 10.000 Kindern auf der ganzen Welt gespielt. Im Jahr 2008 erhielt das Original Play Programm eine Empfehlung vom Nationalen Lehrerfortbildungszentrum in Polen. Als besonders wertvoll wurde herausgestellt, dass die Prinzipien des Original Plays zugleich Einfachheit und Vielfalt fördern. Im Jahr 2014 habe ich Original Play bei der polnischen Vertretung im Büro der Vereinten Nationen in Genf im Rahmen des Seminars "Auf dem Weg zu inklusiver Bildung - Janusz Korczak und die Konvention über die Rechte von Kindern" vorgestellt. Das Seminar fand im Mai 2014 in den Räumlichkeiten des polnischen Konsulats statt. Das Polnische Komitee der UNESCO übernahm die Schirmherrschaft für das internationale Projekt "Bildung für den Frieden - internationales Schulaustausch-Projekt". Seit 2004 leite ich das Original Play Promotion Center, das Original Play in Polen und anderen Ländern koordiniert und verbreitet. 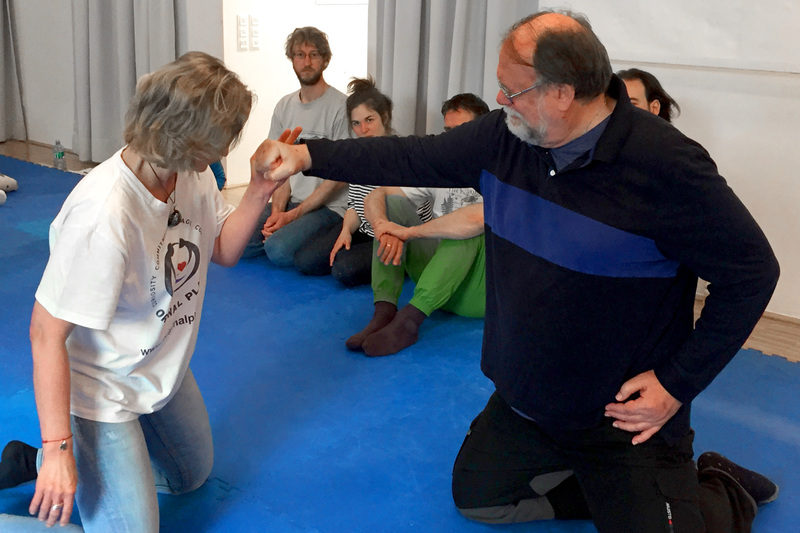 Ich organisiere internationale Trainingsseminare in Original Play. Zu diesen Seminaren kommen Spezialist*innen aus der ganzen Welt: den USA, Österreich, Schweden, Deutschland, Italien, Griechenland, der Tschechischen Republik, der Schweiz, Holland, Bahrain und Frankreich. Ich bin Gründerin, Mitglied des Aufsichtsrats und des Vorstandes der "Internationalen Stiftung für Original Play" und Vorstandsmitglied des Vereins "Original Play Österreich - von Herzen spielen". 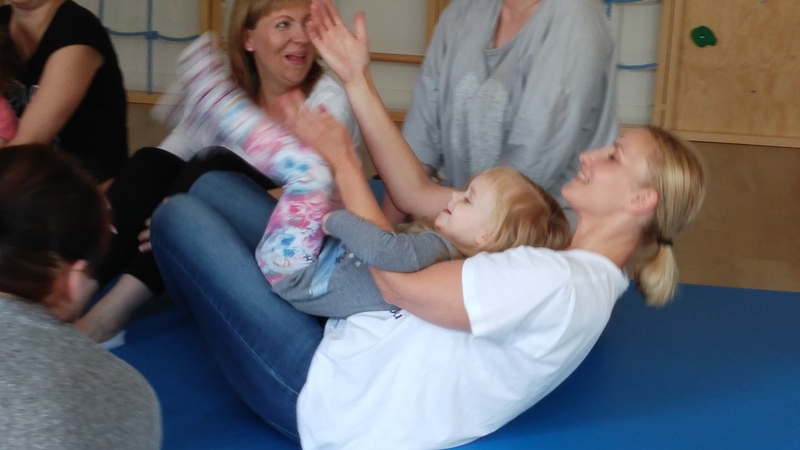 The Third Conference for „Young children – Cognition in play” at The Academy of Special Needs Education, in 2017. The Third Conference at The School of Economics and innovation in Lublin dedicated to „Communication and Interaction with People with Autism and Asperger Syndrome” in 2016. The Third Edition of The Conference in PEDAGOGIUM – School of Social Studies in Warsaw dedicated to „How good is a person – orphanhood – emanation of good or bad?" in 2016. The seminar dedicated to Janusz Korczak „Inclusive education – Janusz Korczak and Convention of the Rights of the Child” in the Permanent Mission of the Republic of Poland to the United Nations, in 2014. The Conference „We are making children's dream come true” organised by Urząd Dzielnicy Targówek Miasta Stołecznego Warszawy, in 2014. The Conference „Peer relationships without violence – solutions to the problem of violence and the phenomenon of exclusion among kids and teenagers”; the conference organised by Urząd Dzielnicy Żoliborz Miasta Stołecznego Warszawy, in 2012. The International Conference „To the one, who loved with heart” dedicated to commemoration of The Year of Janusz Korczak” organised by Podkarpackie Centrum Edukacji Nauczycieli, in 2012. The Tenth Conference for teachers „Education in integration”, Gdańsk, in 2010. The Conference Original Play „Playing by heart – education for peace in the world of conflicts and competition”, under the auspices of The Polish Committee for UNESCO and Urzędu Dzielnicy Żoliborz, Warszawa, in 2009. The seminar „Childrens' health should be accorded particular care”, Warsaw, in 2009. The seminar „The basics of education. The subject in the pedagogical discourse” Akademia J. Długosza, Częstochowa,in 2009. The seminar „The basics of education. Epistemology vs. Educational practice” Akademia J. Długosza, Częstochowa, in 2009. The seminar „The basics of education. Continuity and change” Akademia J. Długosza, Częstochowa, in 2008. The Fourth Conference of Principals of Kindergarten organized by Ogólnopolskie Stowarzyszenie Kadry Kierowniczej Oświaty, Miętne, in 2008. The second Warsaw Forum of Parents and Parents' Council, in 2008. The Centre for Teachers' Improvement, Warsaw, in 2007. The Third Educational Festival in Płock, in 2007. The Conference for teachers organized by the publishing house Librus i Mac, Katowice. The presentation of Original Play – the lecture in The Elementary School Etz Chaim in Wrocław; organized by Integracyjny Punkt Przedszkolny "Puchatkowa Załoga" i ASTO Ośrodek Terapeutyczno – Edukacyjny. 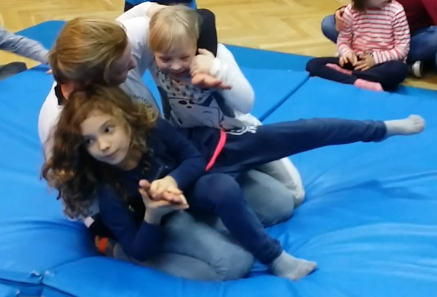 Project "Integration” for students of primary school (Niepubliczna Szkoła Podstawowa “Nasza Szkoła”) and children from special kindergarten (Przedszkole Specjalne Nr 249) in Warsaw, 2018. Project "Integration” for students of primary school (Niepubliczna Szkoła Podstawowa “Nasza Szkoła”) and special school (Zespół Szkół Specjalnych Nr 100) in Warsaw, 2017. 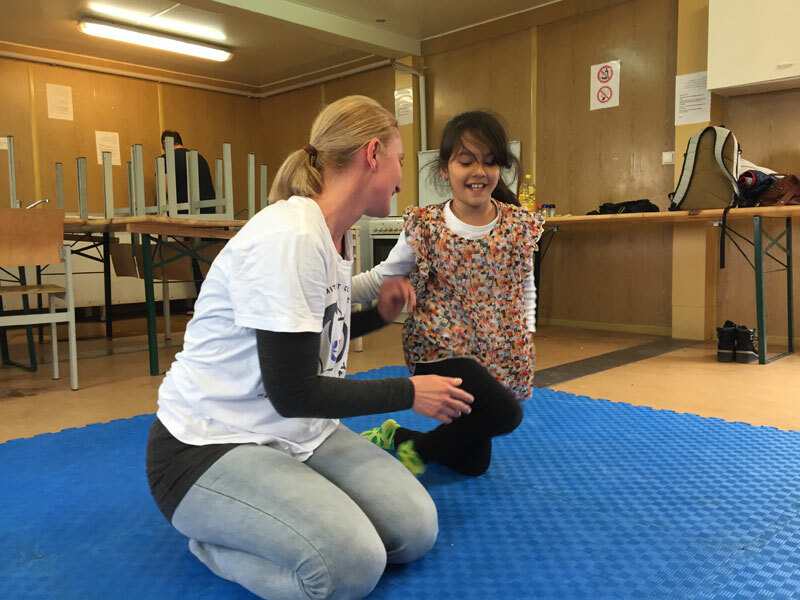 Project „To learn social skills” for children from two integration kindergartens (Przedszkole nr 412 z Oddziałami Integracyjnymi and Przedszkole Integracyjne Nr 120) in Warsaw, 2016. 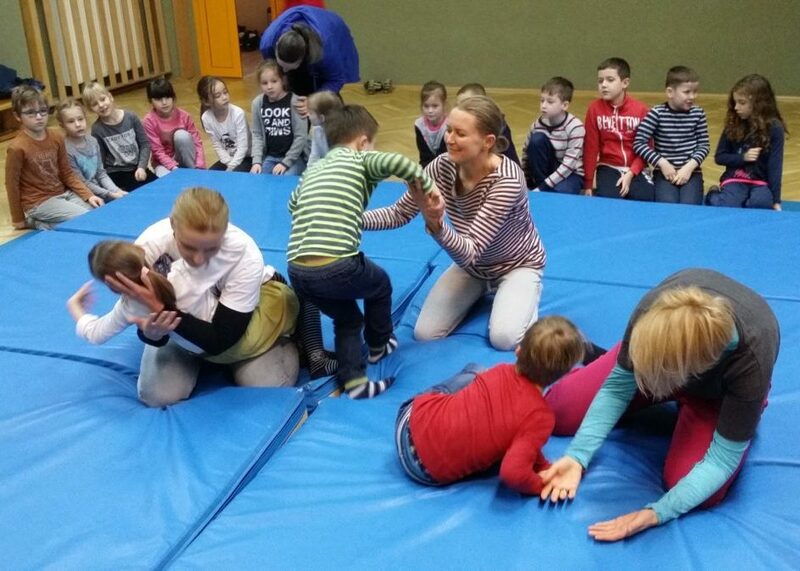 Project “Life without a slap- happy childhood and responsible parenthood” students of school in Borzęcin Duży and kids from socio therapeutic center in Józefów, 2014. Prevention Anti- Alcoholic Project in Borzęcin Duży, 2014. Integration Project including students of gymnasium, high school and students of special school (Społeczne Liceum Ogólnokształcące nr 7, Społeczne Gimnazjum nr 55, Zespół Szkół Specjanych Nr 100) in Warsaw, 2014. 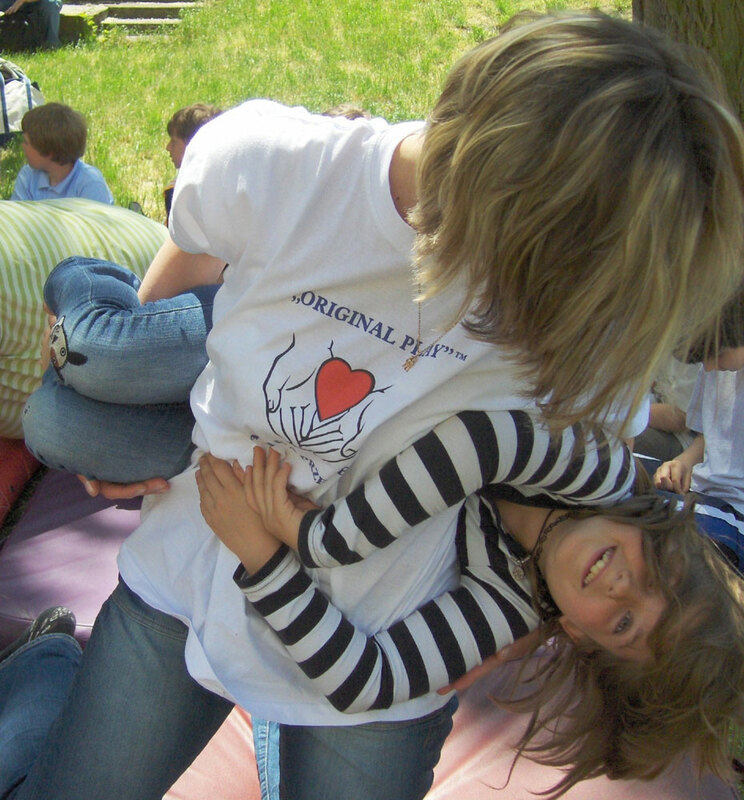 Project “Happy childhood” including students of gymnasium and high school playing with children in the orphanage (Społeczne Liceum Ogólnokształcące nr 7, Społeczne Gimnazjum nr 55, Dom Dziecka Nr 16) in Warsaw, 2013. Prevention Project "Against aggression and violence, to recognize and to name emotions”, 2011. 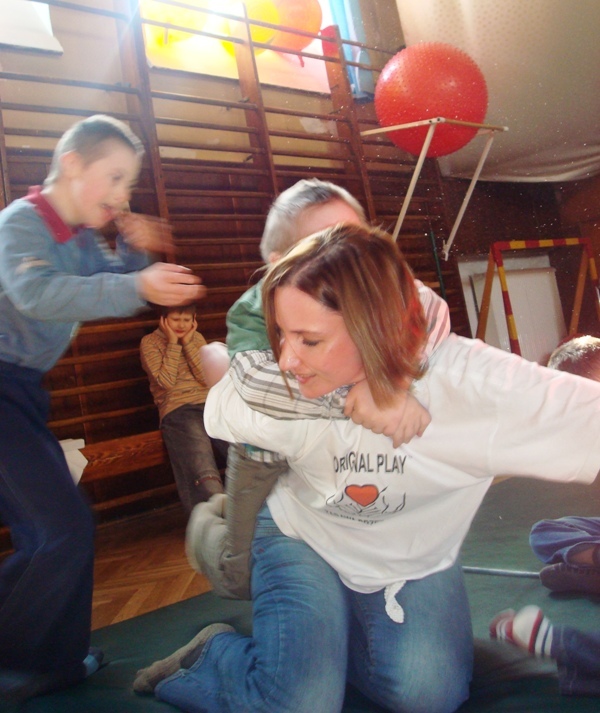 Project „Play together teaches and develops us”, Warsaw, 2010. Project "Original Play. 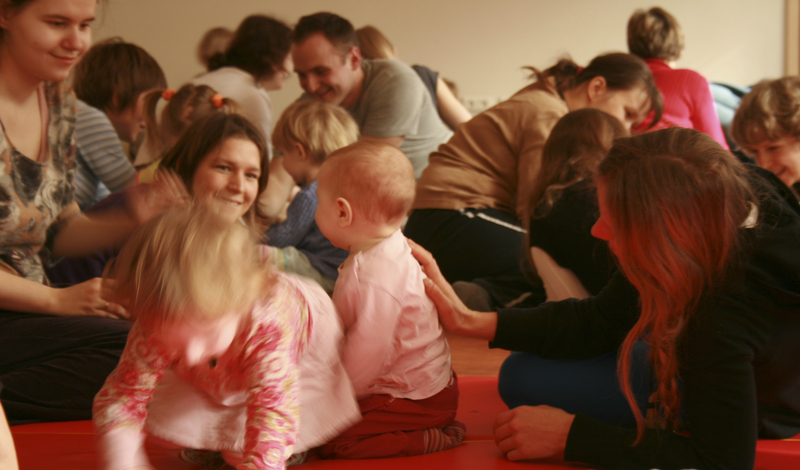 The school – the safe place to learn and develop”, Warsaw, 2009. The prevention project "Project against aggression", Warsaw, 2008. The International School Exchange Project, 2008- 2014. 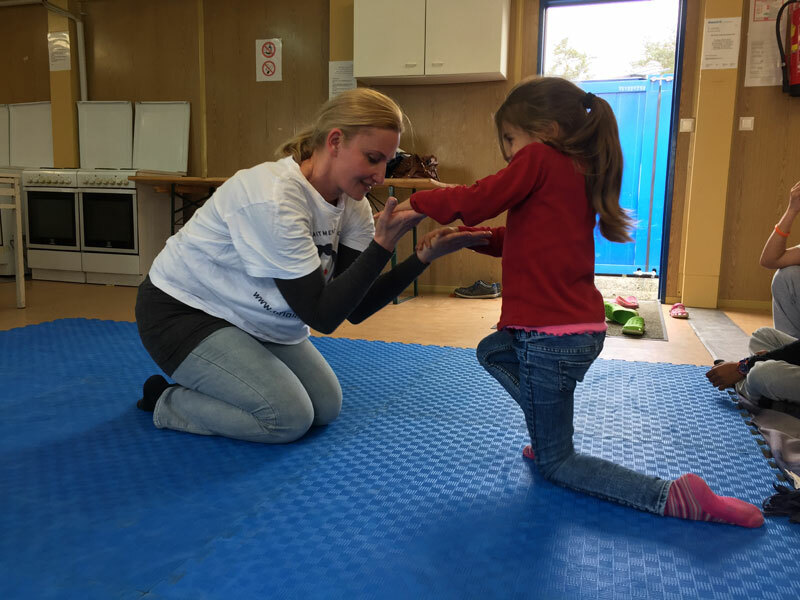 The aim of the project was to use the Original Play Program to create a feeling of belonging among children from Austria and Poland, as a pilot program to use Original Play as a means of cultural and social integration among children from European countries. This is an innovative undertaking in Europe, demonstrating that through Original Play it is possible to remove linguistic and cultural barriers, and at the same time create the fundamental and indispensable conditions for development of peace in the world. The project was realized in 4 stages: 1. The children from Poland and Austria participated in the project in Warsaw, 2008. 2. The children from Poland and Austria participated in the project in Sistrans/ Innsbruck, 2008. 3. The children from Poland, Austria, Germany and Italy participated in the project in Warsaw, 2009. 4. The teenagers from gymnasium and high school (Społeczne Liceum Ogólnokształcące Nr 7, Społeczne Gimnazjum Nr 55) participated in a school exchange project in USA, 2014. Project “Childhood without violence and fear", Warsaw, 2007. Częstochowa. Graczykowska J., Foks U. (2009), The Education for Peace- The International School Exanche Project in Original Play [in:] [w:] A. Gofron, M. Piasecka (red.) The base of eduaction. The continuity and change, Częstochowa. Graczykowska J. (2010), To give and receive love- the role of Original Play in educational practice and theory [in:] A. Gofron, B. Łukasik (red.) The base of education. The entity in pedagogical discourse, Kraków. Graczykowska J. (2009), Original Play®- the foundation for learning and development of children in kindergarten’s age. ABC Wychowania i Zdrowia, Nr 24. Integracyjny Punkt Przedszkolny "Puchatkowa Załoga"
Kaszubska Fundacja Rehabilitacji Osób Niepełnosprawnych "Podaruj trochę słońca"
III Ogólnopolska Konferencja Naukowo- Szkoleniowa w Wyższej Szkole Ekonomii i Innowacji w Lublinie, poświęcona „Komunikacji i interakcji w pracy z osobami autystycznymi i Zespołem Aspergera”, 2016 r.
II edycja Ogólnopolskiej Konferencji Naukowej w PEDAGOGIUM Wyższej Szkole Nauk Społecznych w Warszawie na temat: Ile dobrego jest w człowieku ? Sieroctwo-emanacje dobra czy zła?”, 2016 r.
Seminarium poświęconym Januszowi Korczakowi: „ Ku edukacji włączającej- Janusz Korczak i Konwencja Praw Dziecka” w siedzibie Polskiego Przedstawicielstwa przy ONZ, 2014 r.
Konferencja „ Spełniamy marzenia dzieci” zorganizowana przez Urząd Dzielnicy Targówek Miasta Stołecznego Warszawy, 2014 r.
Konferencja Original Play® w Urzędzie Miejskim w Sosnowcu, 2013 r.
Międzynarodowa Konferencja pt. „Temu, który ukochał sercem”, poświęcona obchodom Roku Janusza Korczaka; organizator Podkarpackie Centrum Edukacji Nauczycieli; 2012 r.
Konferencja Original Play® „Zabawa przez serce- Edukacja dla pokoju w świecie konfliktów i rywalizacji”, pod patronatem Polskiego Komitetu ds. UNESCO oraz Urzędu Dzielnicy Żoliborz, Warszawa 2009 r.
Konferencja dla nauczycieli przez Wydawnictwo LIBRUS i MAC, Katowice. Projekt „Dzieciństwo bez przemocy i lęku”, 2007r. Projekt zajęć dla dzieci w ramach profilaktyki przeciw agresji; realizacja w ponadgminnych świetlicach wsparcia dziennego na terenie Powiatu Warszawskiego Zachodniego, 2007 i 2008r. Projekt „Original Play - Szkoła bezpiecznym miejscem dla rozwoju i uczenia się”; Projekt profilaktyczno- korekcyjny, realizacja 2009 r.
Projekt „Original Play - Wspólna zabawa uczy nas i rozwija”; projekt profilaktyczno- korekcyjny; realizacja 2010 r.
Projekt Original Play, z zakresu przeciwdziałania agresji i przemocy, prawidłowego rozpoznawania i nazywania emocji”, realizacja 2011 r.
Realizacja zajęć Original Play dla dzieci i młodzieży w ramach Projektu „Życie bez klapsa - szczęśliwe dzieciństwo i odpowiedzialne rodzicielstwo”; organizator Powiatowe Centrum Pomocy Rodzinie w Ożarowie Maz. ; realizacja 2014 r.
Projekt zajęć Original Play dla dzieci w ramach profilaktyki antyalkoholowej; realizacja 2014, Borzęcin Duży. Projekt Międzynarodowej Szkolnej Wymiany w Original Play. piąty etap projektu odbył się w USA, w 2013 r. Uczestniczyła w nim młodzież jednego z warszawskich gimnazjów i liceów. Projekt Kształtowanie Umiejętności Społecznych w oparciu o program Original Play dla dzieci w wieku przedszkolnym. Integracja dzieci z dwóch przedszkoli integracyjnych, Warszawa, 2016 r.
Projekt integrujący poprzez Original Play dzieci ze Szkoły Nasza Szkoła i dzieci z Zespołu Szkół Specjalnych Nr 100 w Warszawie. Projekt dla uczniów gimnazjum i liceum; prowadzenie zajęć Original Play z dziećmi ze Zespołu Szkół Specjalnych Nr 100 w Warszawie. Projekt dla uczniów gimnazjum i liceum; prowadzenie zajęć Original Play w dziećmi z Domu Małego Dziecka w Warszawie. Projekt "Integration” für Schüler der Grundschule (Niepubliczna Szkoła Podstawowa “Nasza Szkoła”) und Kinder des Spezialkindergartens (Przedszkole Specjalne Nr 249) in Warschau, 2018. Projekt "Integration” für Schüler der Grundschule (Niepubliczna Szkoła Podstawowa “Nasza Szkoła”) und der Sonderschule (Zespół Szkół Specjalnych Nr 100) in Warschau, 2017. Projekt „Soziale Fähigkeiten lernen” für Kinder aus zwei Integrationskindergärten (Przedszkole nr 412 z Oddziałami Integracyjnymi und Przedszkole Integracyjne Nr 120) in Warschau, 2016. 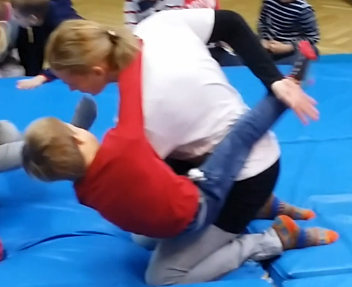 Projekt “Leben ohne Schläge - glückliche Kindheit und verantwortungsvolle Elternschaft” für Schüler der Schule in Borzęcin Duży und Kinder des sozialtherapeutischen Zentrums in Józefów, 2014. Anti-Alkohol-Präventionsprojekt in Borzęcin Duży, 2014. Integrations-Projekt für Schüler von Gymnasium, weiterführender Schule und Sonderschule (Społeczne Liceum Ogólnokształcące nr 7, Społeczne Gimnazjum nr 55, Zespół Szkół Specjanych Nr 100) in Warschau, 2014. 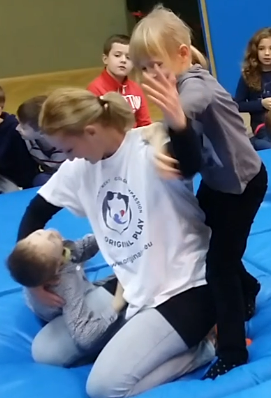 Projekt “Glückliche Kindheit” für Schüler von Gymnasium und weiterführender Schule, die mit Kindern im Waisenhaus spielen (Społeczne Liceum Ogólnokształcące nr 7, Społeczne Gimnazjum nr 55, Dom Dziecka Nr 16) in Warschau, 2013. Präventionsprojekt "Gegen Aggression und Gewalt, Gefühle erkennen und benennen”, 2011. Projekt „Zusammen spielen bildet und entwickelt uns”, Warschau, 2010. Projekt "Original Play. Die Schule – ein sicherer Ort zum Lernen und Wachsen”, Warschau, 2009. Präventionsprojekt "Projekt gegen Aggression", Warschau, 2008. Internationales Schulaustausch Projekt, 2008- 2014. Das Ziel des Projekts war es, das Original Play Program zu benutzen, um ein Gefühl der Verbundenheit zwischen Schülern aus Österreich und Polen entstehen zu lassen, als ein Pilotprojekt, in dem Original Play als Methode für kulturelle und soziale Integration von Kindern aus Europa verwendet wird. Dieser Ansatz ist innovativ in Europa. Er beweist, dass es möglich ist, durch Original Play sprachliche und kulturelle Barrieren zu überwinden und gleichzeitig die fundamentalen und unabdingbaren Vorraussetzungen für Frieden in der Welt zu schaffen. Das Projekt wurde in 4 Stufen realisiert: 1. Die Kinder aus Polen und Österreich nahmen am Projekt in Warschau teil, 2008. 2. Die Kinder aus Polen und Österreich nahmen am Projekt in Sistrans/ Innsbruck teil, 2008. 3. Die Kinder aus Polen und Österreich, Deutschland und Italien nahmen am Projekt in Warschau teil, 2009. 4. Die Kinder aus dem Gymnasium und der weiterführenden Schule (Społeczne Liceum Ogólnokształcące Nr 7, Społeczne Gimnazjum Nr 55) nahmen am Schulaustauschprojekt in den USA teil, 2014. 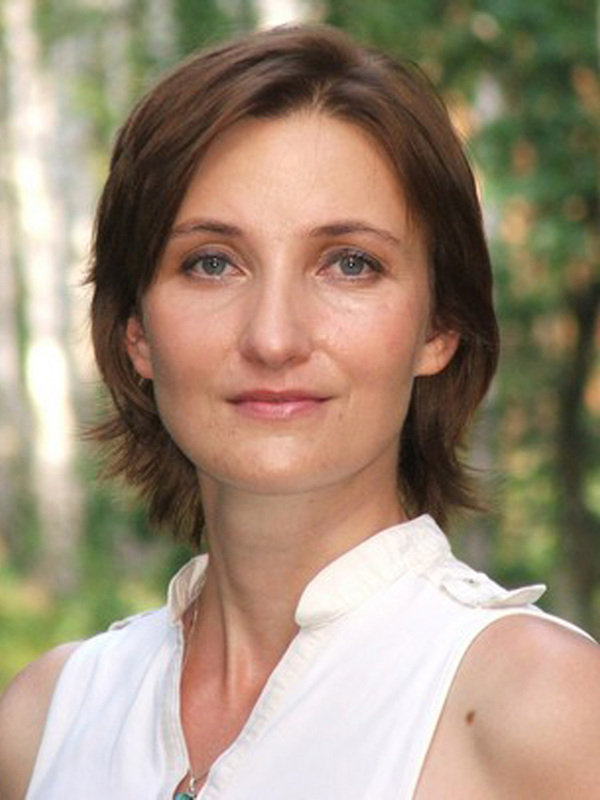 Graczykowska, J. (2010): Dawać i otrzymywać miłość- rola Original Play® w praktyce i teorii edukacyjnej (Liebe geben und empfangen - die Rolle von Original Play® in der pädagogischen Praxis und Theorie) in Gofron, A., Piasecka, M. [Hg.] Podstawy edukacji. Podmiot w dyskursie pedagogicznym (Entität im pädagogischen Diskurs), Krakau. Graczykowska, J. (2009): Edukacja dla Pokoju- Projekt Międzynarodowej Szkolnej Wymiany Dzieci w ramach programu „Original Play®“ (Erziehung zum Frieden - Das internationale Schulaustauschprojekt für Kinder im Rahmen des Original Play® Programms) in Gofron, A., Piasecka, M. [Hg.] Podstawy edukacji. Ciągłość i zmiana (Grundlagen der Erziehung. Kontinuität und Wandel), Częstochowa. Graczykowska, J. (2008): Doświadczenia i korzyści z wdrażania programu „Original Play”™ wśród dzieci i młodzieży w Polsce (Erfahrungen und Nutzen bei der Umsetzung des „Original Play“™ Programms mit Kindern und Jugendlichen in Polen) in Gofron, A., Piasecka, M. [Hg.] Podstawy edukacji. Epistemologia a praktyka edukacyjna (Grundlagen der Erziehung. Epistemologie und pädagogische Praxis), Częstochowa.